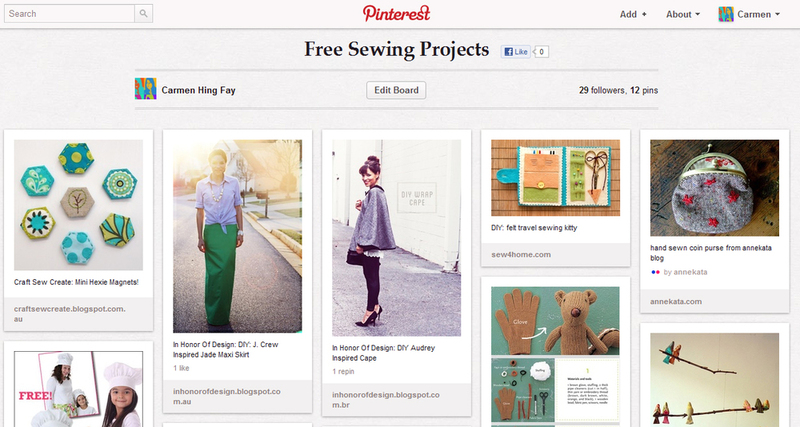 Pinterest is a great way to keep all your favourite stuff on a virtual pinboard. Here's just some of my Pinterest boards! Seamstresses may be interested in my Free Sewing Projects, Sew what now? (sewing inspiration) and Book Book Book (favourite sewing tomes) pinboards. When you pin a picture, Pinterest automatically stores a link to the site so you can find it again easily. Great for all the stuff I've been meaning to sew. Link. Published on November 28, 2012 by Carmen Hing Fay. Sweet apron dress for a one-year-old. Pocket upcycled from some upholstery fabric samples. It's reversible too for when you spill stuff on the front! This week's project - open an Etsy store - Clothesline Emporium. My cunning plan is to sell super easy sew in one hour type patterns, fabulous fabric and ready made clothing for time-poor seamstresses. Can't wait to open shop, so I'm starting out with just a trio of handmade little girls dresses. Link. Published on November 21, 2012 by Carmen Hing Fay. I love sewing but never seem to find enough time to make clothes. My new cunning plan is to wear something handmade to church every Sunday. That's my own little protest against mass production! This week's effort saw me channelling Jil Sander. I loved the Navy collection, so drafted and made my own little button backed stripey shirt with a contrasting collar. Ta da! Link. Published on October 24, 2012 by Carmen Hing Fay.